This post is going to focus on data selection using a specific example. The purpose is to show that you shouldn't rule out splitting up your tables on the premise that it will make it impossible to work with the data. 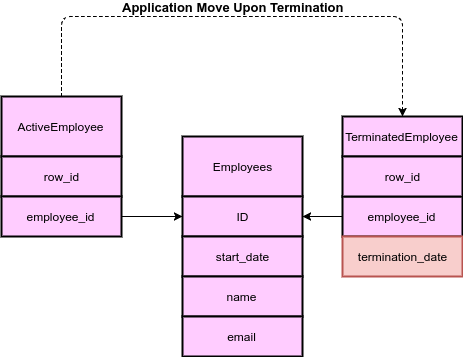 Your table structure should be purely based on the relationship needs of your database. If you want, you can go the extra step to ensure that an employee cannot be in both the active and terminated tables. If you only need limited data, performing a nested query is often faster than performing a join. If you only need the id and name of employees that were terminated then a nested query is often faster than performing a join. The example below will select all employees that were terminated in January of 2017. Although I think the real needs of an application to do this are limited, you can still select absolutely everything from all of the tables when you need it. MySQL: FULL OUTER JOIN - How do I merge one column?